Home > Resources > Transfer > How to Transfer Apps from Android to Another Android? If you are an app fan and love to download various apps on your Android phone or Android tablet, you must be unwilling to give up these favorite apps when you decide to change from your old Android phone to another new. After all, it is time consuming to research and re-download apps one by one again. Thus, people will need a solution to easily and quickly transfer apps and other more files to new Android device. Then, is there any way available for us to transfer apps from one Android phone to another Android phone or tablet with a click? The answer is YES! Coolmuster Android Assistant is just such a transferring tool for Android users to copy Android apps to computer and sync to another Android by clicking on one button. Meanwhile, you can even install, uninstall and manage Android apps on computer directly. Not only apps, but also other files like contacts, text messages, call logs, videos, photos, music and more data types are all supported by the Android Assistant. Download it for free on your computer and see how it works. 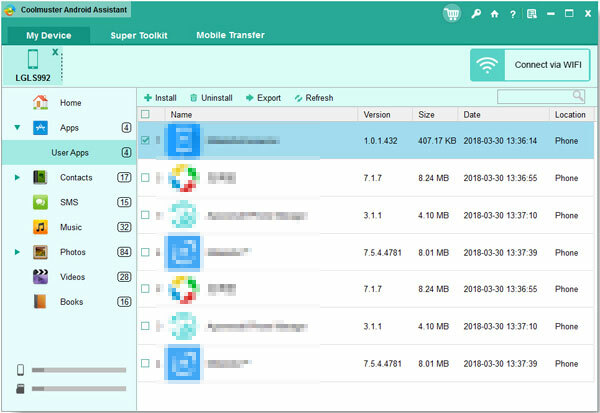 Keep on reading the tutorial below and you will find this Android App Transfer is specially designed to meet your data transferring and managing demands. Install and launch the easy-to-use Android Apps Transfer on your computer. Connect your old Android phone or tablet with this computer via a USB cable. The program will detect and show the Android device on its primary window. Choose "Apps" option from the left if you only need to export Android apps. Just preview and select those you want and click on the button of "Export" to move them to the computer. Just choose an easy-to-remember location to save them. After exporting, all your selected apps will be saved to computer. Now, you can eject the old Android from computer and plug-in the new Android. After it is detected by the Android Assistant, you can directly go to the "Apps", choose "Install" button to sync the transferred apps to the new Android phone or tablet with one click. You may wonder, can it backup Android contacts to computer? Of course, it can. Just download it and try! We have another app transfer program for Android users - Mobile Transfer. It is specially designed for phone users to transfer data between two mobile devices, including contacts, apps, SMS, photos, videos, music and so on. 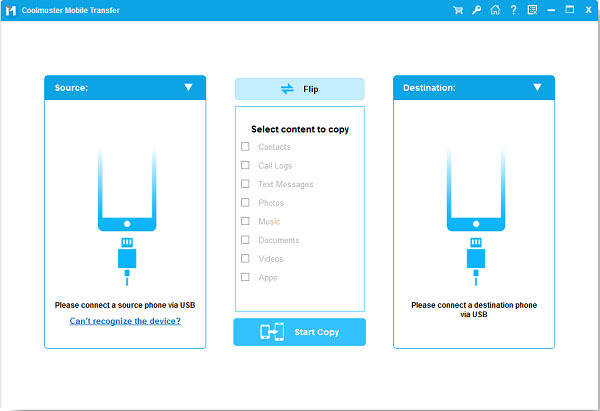 With it, you can transfer apps from one Android device to another Android device with one click. What's more, it is widely compatible with almost all Android phones or tablets, such as Samsung, LG, Huawei, Sony, HTC, Motorola, OPPO, ZTE, Meizu and more. Preparation: Download and install the free trial version of the Mobile Transfer on your computer. Then, pick up two USB cables to connect the two Android phones/tablets to the same computer. Step 1. Launch the installed Mobile Transfer and you can see the program interface as pictured in the below. Please connect your two Android phones to computer with 2 USB cables to continue the process. Step 2. All the file types that can be transferred are displayed in the middle. If you only need to transfer apps between the two Android devices, you can just tick off the "Apps" tab. Make sure your Source device and Destination phone are on the correct side, if not, please click "Flip" button to change the position. Step 3. After selection. Just click on the "Start Copy" button. Then, all the apps from the old Android phone will be transferred to the new one automatically. 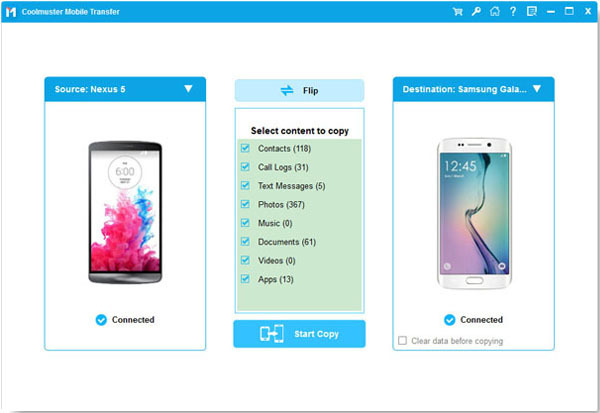 Tips: We also have a post telling you how to transfer contacts from Samsung to Samsung.